Alliance Aerospace Engineering designs, develops, manufactures, inspects, and distributes certified FAA-PMA (Parts Manufacturer Approval) parts to meet FAA, European Aviation Safety Agency (EASA), and Civil Aviation Authority (CAA) requirements. Alliance Aerospace Engineering parts are designed in accordance with the PMA standards issued by the FAA under 14 CFR Part 21. We utilize state-of-the-art scanning and modeling techniques, CAD, solid modeling, structural analysis, and innovative PMA designs. Alliance’s in-house engineering staff consists of FAA-PMA industry veterans who have over 100 years of combined experience. Our network of FAA representatives includes Designated Airworthiness Representatives (DARs), Designated Engineering Representative( DERs), and Designated Manufacturing Inspection Representative (DMIRs) who are located both on and off-site. This network ensures adherence to safety and design requirements and allows for expedient FAA supplement approvals. Alliance Aerospace Engineering has a strategic partnership with JCM Engineering Corp, a leading manufacturer of highly complex, precision-machined components and assemblies for the aerospace, commercial, and defense industries. This partnership has created an infrastructure that is fully supportive of the aerospace industry. JCM is a privately owned corporation that is based in Ontario, California. 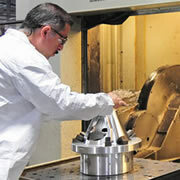 From its 140,000 square foot state-of-the-art facility, the company employs nearly 110 associates and hosts more than 70 of the industry’s most innovative CNC machines and technologies. JCM has worked on dozens of the most prestigious aerospace programs such as Boeing’s C-17, 787, Lockheed’s C-5, F-22, F-35, Sikorsky’s UH-60, and CH-53K. JCM has also been awarded numerous long-term contracts. Due to JCM’s extensive industry knowledge base, exceptional customer service, innovative equipment, and revolutionary mindset, JCM will continue to be a competitive player in the industry. From design through manufacturing, our team manages the entire program meticulously through detailed communication with all stakeholders. Our goal is to launch each product on time, every time, to the required specifications. With Alliance’s experts, you can be assured that each program will be managed with the necessary resources and skills to be successful.